The names of Hennessy, Martell, Courvoisier, and Rémy Martin, or the Big 4 Cognac Houses are instantly recognizable wherever in the world you might be. Indeed, these top four Cognac maisons dominate all global sales of the iconic French Brandy. Many people have a penchant for one or more, and staunch fans of a certain brand will certainly advocate that their choice is, ‘the best’. 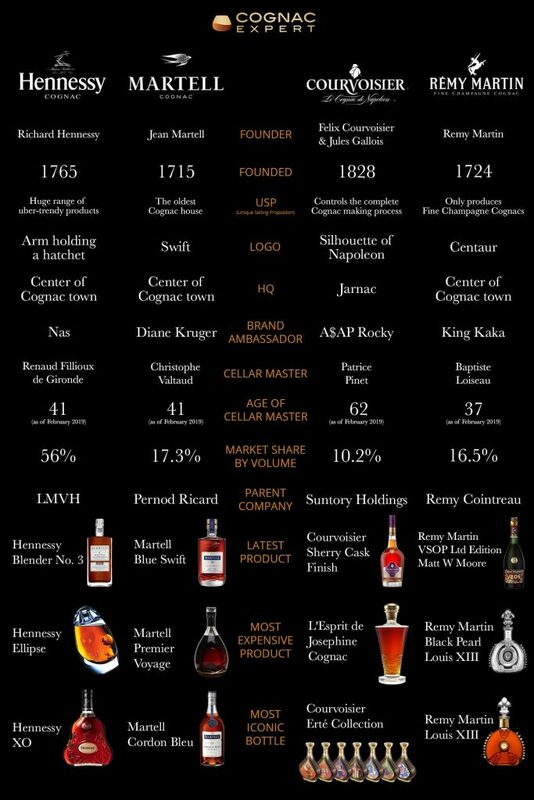 But is there actually a difference between the 4 biggest Cognac brands? And if so, what might this be? Cognac Expert has delved into the world of the Cognac giants to bring you the definitive guide as to how each of the famous brands manages to remain true to its roots, retain its own identity, and is certainly different from its closest competitors. The name of Hennessy is, for many, synonymous with luxury. 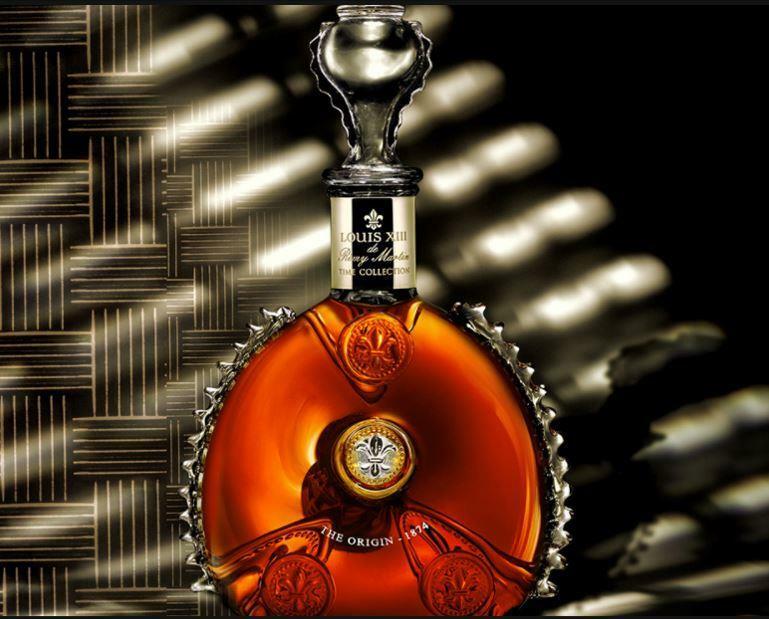 It’s the world’s best selling Cognac brand, managing to steadily increase sales year on year. It’s last sales figures (2017) showed an impressive 8.5% increase, with significant growth in both the US and China. It’s total sales in 2017 were 7.1 million 9 liter cases. Hennessy was founded in 1765 by Irishman, Richard Hennessy, and his son James, and has been passed down through the generations. In 1971 Kilian Hennessy created the group Moet Hennessy in a merger with Champagne house, Moet et Chandon. In 1987 they then merged with the clothing brand, Louis Vuitton, to become LVMH (Louis Vuitton Moet Hennessy), and the largest such luxury goods group in the world. Despite its size, Hennessy retains a fierce champion of family. The hallowed position of Cellar Master has been passed down through eight generations of the Fillioux Family, with Renaud Fillioux de Gironde at the helm today. A unique aspect of Hennessy Cognac is that the responsibility for each and every eau-de-vie is not down to a single person. Instead the house has a Tasting Committee. This group of eight people meet every morning at 11:00 to discuss and taste various Cognacs. In fact, they sample between 7,000-8,000 each and every year. Now, who wouldn’t want that job? 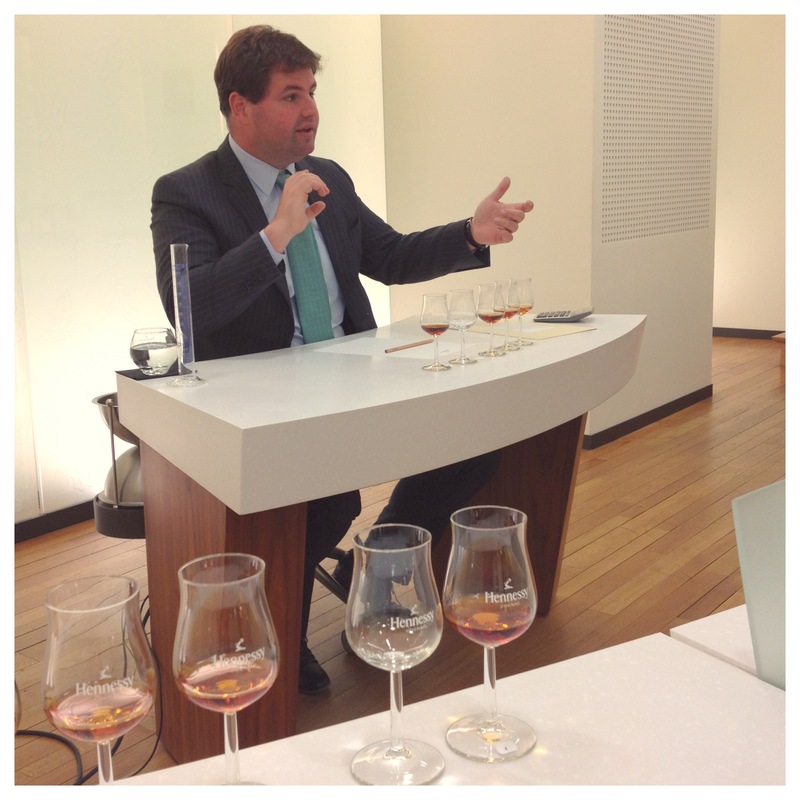 Discover more about the intricate (and long) journey to becoming a member of the Hennessy Tasting Committee in our article, Cognac Expert’s Visit to Hennessy Cognac. 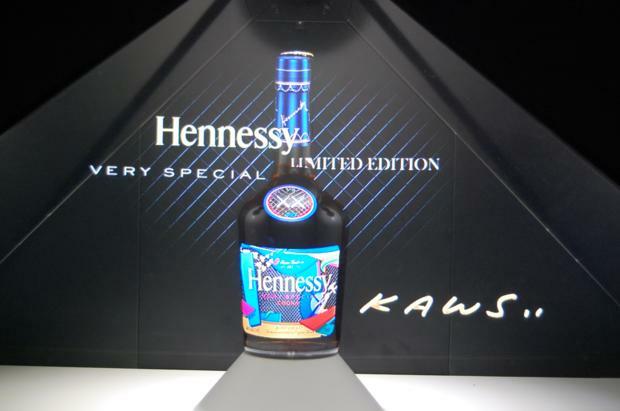 Hennessy is well known for its younger Cognacs, and puts a lot of effort into the creation and marketing of its Hennessy VS. They’ve successfully targeted the younger generation of Cognac drinkers who enjoy their Henny in a cocktail or mixed drink. They’ve also championed collaborations between young artists and bottle creations, with their hightly sought after limited edition VS bottles by the likes of Futura X, Shepard Farey, and Kaws. Best known for: Uber trendy, affordable Cognacs. Find out more here about market leader, Hennessy and the different Cognacs they have on offer. With a history dating back to 1715, Martell proudly holds its status as the oldest of the large houses. 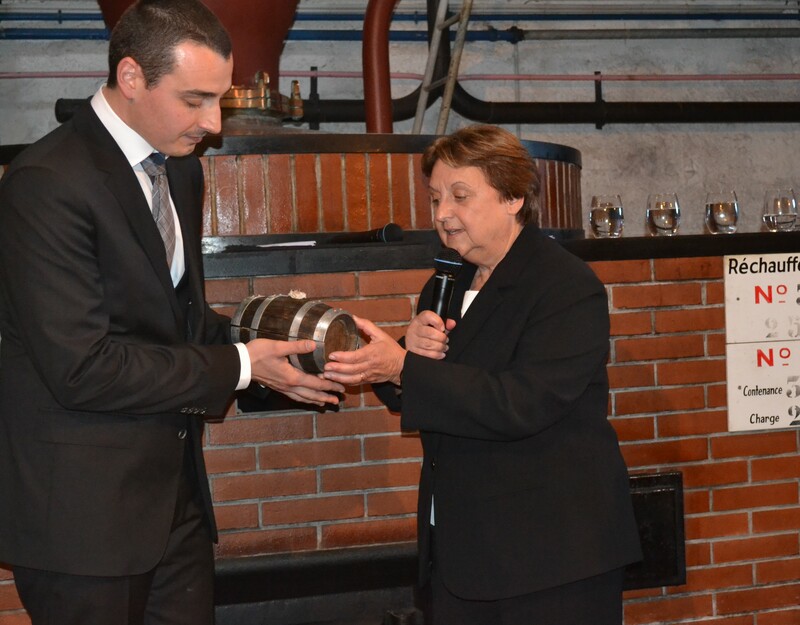 It was created by Jean Martell, and to this day continues his dream of producing only the highest quality Cognac. Over the past years Martell has increased its market share of global sales, and in 2017 held onto its number two spot with sales of 2.2 million 9 liter cases. In 2016 the house appointed a dynamic young cellar master, Christophe Valtaud. At only 38 years of age when he took the position, he was at that point one of the youngest people to ever hold such an esteemed position. Read more in our article, The Role of the Cellar Master. With Cognac being the drink of choice for rap and hip hop artists, Martell totally bucked the trend when selecting its brand ambassador. In a move that mirrors its stylish, quality products, the house chose actress, model, and Francophile, Diane Kruger to spearhead the brand. The house of Martell is well known for Cognacs that showcase the very best of the Borderies and Fins Bois terroirs. 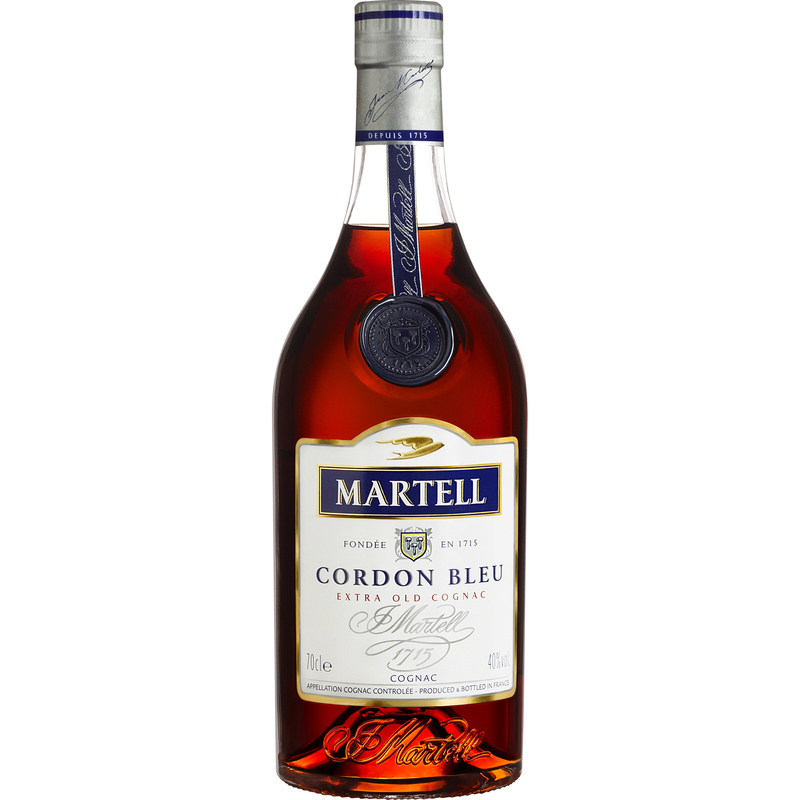 Indeed, one of its most famous offerings is the world favorite, Martell Cordon Bleu. This multi-award winning XO was created in 1912 by Edouard Martell. Such is the success of this iconic Cognac that the recipe remains exactly the same today, and is a wonderful example of how great a Borderies eau-de-vie can be. The house of Martell doesn’t produce such an extensive range as its competitors. Nor do they have as many in the lower price range. Instead they produce a carefully considered range of Cognacs that appeal to the discerning palate, with offerings such as Martell L’Or de Jean Martell, and Martell Chanteloup. 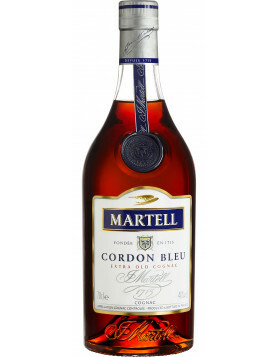 They have also pushed the boundaries of Cognac with the release of the Martell Blue Swift, an ‘eau-de-vie-de-vin’ that was finished in Kentucky Bourbon barrels. Discover more about the historic brand of Martell, and their wonderful array of luxury Cognacs. Famous for its Centaur logo, the house of Remy Martin ranks as number three in the world in terms of sales. Last year they shipped 2.1 million 9 liter cases around the world, and their fan base remains as strong and loyal as ever. In terms of age, Remy is knocking on the door of its competitor, Martell, but loses out on the ‘oldest’ title by a mere 9 years.. The house was created in 1724, and boasts a tumultuous history of mergers, feuds, and acquisitions. It’s a firm favorite in China and Asia, as well as in the US and other areas of the world. 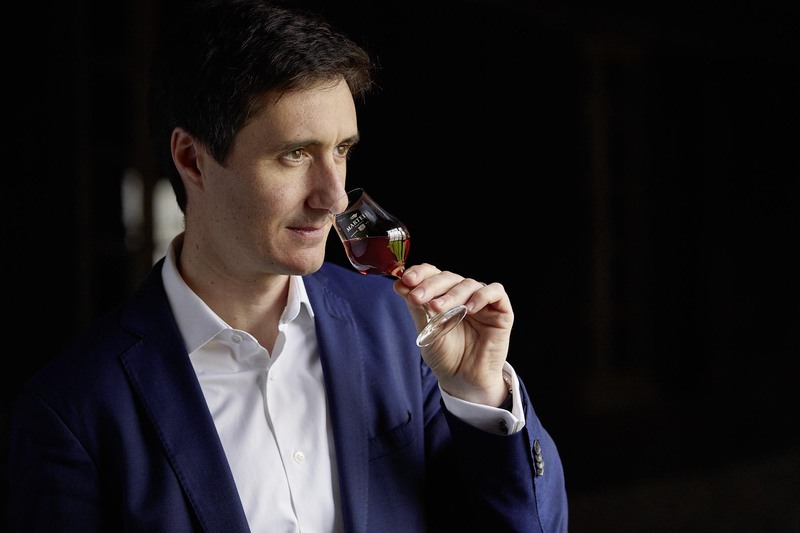 Remy Martin is unique in the fact that they only produce Cognacs from the two premier growth areas of the regions, Grande Champagne and Petite Champagne. 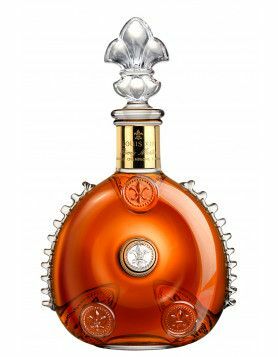 Their flagship product is the Louis XIII, a product that’s now so iconic that it’s almost considered a brand in its own right! Instantly recognizable, thanks to it’s Baccarat Crystal decanter, it’s created from more than 1,200 eaux-de-vie, each aged between 40-100 years. Louis XIII was also reputedly a favorite of UK Prime Minister, Winston Churchill. Remy Martin is part of the larger group, Remy Cointreau, and boasts many firsts when it comes to the larger houses. They had an extremely successful female cellar master, Pierrette Trichet, who was the first ever lady to hold such a position. The house again broke the mold when she handed the mantel across to Baptiste Loiseau in 2014, who at the tender age of 33 was the youngest every to hold such an illustrious position. In 2018 Remy chose humanitarian and rapper, King Kaka, to be their brand ambassador for its ‘One Life Live Them’ campaign. The Kenyan, whose real name is Kennedy Ombina, champions many worthwhile causes in both his home country and further afield. Remy Martin has a similar size range to that of Martell, including some great value VSOPs and Napoleon qualities. They’re also well known for their annual limited edition XO created for the iconic Cannes Film Festival. Delve deeper into the world of Remy Martinand their great variety of Cognacs. Courvoisier’s history stretches back to the early 19thcentury, when Felix Courvoisier and Jules Gallois moved their Parisian wine merchant business to Jarnac, and Courvoisier Cognac was born. It’s the smallest, in terms of volume exported, of the Big Four. However, the word ‘small’ is certainly relative, when you consider the house boasted a grand total of 1.3 million 9 liter cases of Cognac exported in 2017. The master blender, Patrice Pinet, has been with the house a long, time, joining in 1989 and rising through the ranks to take the plum position in 2009. Courvoisier is unique from its big name rivals in the fact that it controls the entire process of Cognac making—from the grape that grows on the vine right through to the bottle that sits on your table. They make a point of working with smaller producers who’ve supplied them for generations. This is in order to blend Cognacs that have the same aromas and flavors each and every year. The logo of the house is, of course, a silhouette of Napoleon Bonaparte. When he was exiled to Saint Helena, he ordered his ship to stop at La Rochelle on the way to pick up several barrels of Courvoisier Cognac to be shipped with him. For many, Courvoisier Cognac reached iconic status thanks to the Busta Rhymes song, Pass The Courvoisier. And the brand continues to reach out to all classes of drinkers, including those more familiar with whisky terminology when they added two age-stated Cognacs to their repertoire, The Courvoisier Vintage Connoisseur 12 Years and the Courvoisier Vintage Connoisseur 21 Years. Since 2014 the house has been under the umbrella of Suntory Holdings, the giant Japanese beverage producer. Tot his day the brand has continued to produce a smaller range than it’s giant competitors, concentrating instead on offering the world it’s high quality, instantly recognizable bottles, in both looks and flavor. Surprisingly, and despite the fact that the brand has been the favorite of the hip hop scene for many years, it was only in 2017 that Courvoisier adopted a brand ambassador in this vein: rapper, actor, and model, A$AP Rocky. Discover more about the global brand of Courvoisierin the Cognac Expert online shop. First of all: a very nice article! But I like to point out a little slip: Hennessy was established in 1765, not 1785. For most expensive product of Martell you could say ‘Premier Voyage’. For most iconic bottle of Courvoisier maybe the Erté series? Thank you Ton, great ideas. And wow that’s a bad mistake we’ll correct. For Martell I would have said perhaps also Martell’s TRUNK which is for sure expensive, and for Hennessy perhaps Beauté du Siecle.